What is black and white all over and not read until the end? It is a universally recognized symbol for “racing” and “performance.” Its importance is absolutely critical to competition. Dropped only once, with just anticipation of its falling, it can bring a crowd to its feet. However, once dropped, it is forgotten. There are many symbols throughout racing. Some are well-recognized international symbols, joined through marketing to winning performances: Red Bull, Rolex, the Goodyear blimp, Coca-Cola, and many more. More symbols are prominently visible at the track – the US flag, the state flag, sponsor flags, direction flags. The racing driver has information and command flags: black with an orange dot, blue with a diagonal yellow stripe, red, white, green. What is the answer to the brainteaser? The one driving flag that stands out above others. It notifies that a race is finished. Very possibly, its appropriateness is so rooted to the sport of automobile racing, its life span, measured in short-tenths-of-a-second, becomes unnoticed - unnoticed because instantly after it is waved, and rightfully so, focus shifts elsewhere. Yes, The Checkered Flag. But, why is it checkered and why does it stand for the finish of a race? Stories, but they are just that – stories – about the checkered flag’s origin vary from French bicycle racing in the mid 1800’s, to naval flags used in ship-to-ship communication, or flag communication on the railways. The horse culture of the American Indians certainly provided for competition, and required something for concluding it. Stories most often credit settlers of the American Midwest with the origin of the checkered flag. At their large public meals a briskly-waved checkered tablecloth of the era, signaled food was ready to be served and the horse racing competitions should come quickly to an end. As the automobile replaced the horse, another story holds that in the early days of racing on dirt tracks, the contrasting colors of the checkerboard pattern made it easy to see, especially in a dirty dusty environment - the perfect flag for the finish line. By the late 1800’s, the Ormond Beach Hotel (ten miles north of Daytona Beach), had become the vacationing spot of wealthy Northeasterners escaping the cold. Pictures still exist of horse racing and automobile racing on the beach. These wealthy Northeasterners became auto racing’s first sponsors when owners pitted their chauffeur-driven cars against one another on the hard beach. Perched on cane-bottom rocking chairs they watched from the hotel’s verandah; wagers were placed in proportion to egos. Today, racecar drivers are still referred to as chauffeurs. In the early1900’s, friends of Ransom E. Olds (father of the Oldsmobile) report he was quick to tell anyone that his nausea at the smell of horse manure was a prime motivation for his love of automobiles. So his friends were not surprised in 1902 when he was the first owner, and original beach record-maker, with an official timed run of 50 MPH. In January of 1904, Henry Ford, in a Ford Arrow, established a World Land Speed Record on the beach – 91.371 MPH. In 1905, the 100 MPH barrier was broken. The beach from Ormond to Daytona was heading toward becoming a world center of automobile racing. Was Ransom Olds first to pass under a checkered flag in 1902, or Henry Ford in 1904 on his way to a World Land Speed Record? History does not record it. Though one of the most enduring mysteries in motorsport, the real story of the flag’s origin is lost to racing history. There is no real definitive explanation as to who first used a black and white checkered cloth to say, “race over” or when. 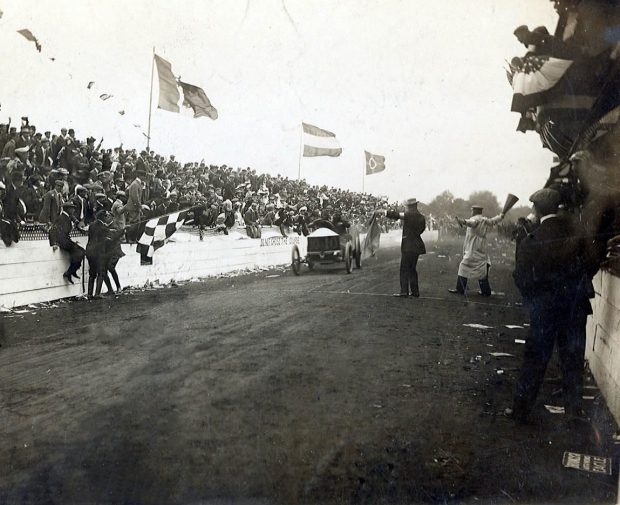 The earliest known record, based on pictures, of a black and white checkered flag being used is by Fred Wagner to end the 1906 Vanderbilt Cup race in Long Island, New York (pictured above). That same year an employee of the Packard Motor Car Company, Sidney Waldon, used the flag to mark “checking stations” (now know as “checkpoints”) along the Glidden Tour rally-style events. By 1935, the beach from Ormond to Daytona had long since become an international center of racing. Known as the “Winter Speed Carnival” that year saw England’s Sir Malcolm Campbell set the fastest official run on the beach. Campbell’s “Bluebird” hit 330mph in one direction. Ten years prior to forming NASCAR, Bill France and partners (disappointed after sea tides cut short a first race in 1936), ran a second race in 1937. The course for these races at the South end of Daytona Beach was one-and-a-half-miles down paved A1A; left over the dunes; North up the beach, chasing the hard packed sand as the tide shifted it; and finally left back across the dunes to complete a lap. With a 3.2-mile course, the 1937 race was 50 miles long. Local bar owner Smokey Purser won under a checkered flag and took home a purse of $43.64. The black and white colors of the checkerboard pattern had long become a universally recognized symbol for racing and performance. The checkered flag had became so symbolic with finishing or completion that it was posted at each corner of the end zones in the original Yankee Stadium when the facility was used by the New York Giants of the National Football League from 1956 through 1973. In 1980, USAC flagman Duane Sweeney started a tradition at the Indianapolis 500 waving twin checkered flags at the completion of the race. 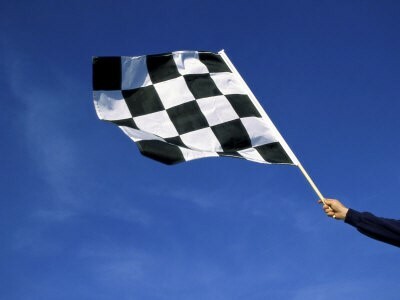 Previous flagmen had only used a single checkered flag. Johnny Rutherford’s Checkered Flags at that 1980 race were worth $318,820. 2014’s winner Ryan Hunter-Reay’s flags were worth $2.49 million. Peak performances on the racetrack must exploit a chain of interwoven factors. Factors like skill, motivation, track management, judgment, the car, and the tires all must perform “in sync” with one another. The car and driver form a “package” that must negotiate a course with a bunch of competitors all wanting to lead the pack. So it is in life. There are usually a handful of factors that must work interdependently and are critical to achieve success. Getting the most out of our personal strengths and resources requires an objective evaluation of our capability in each critical factor. The “package” (on the race track or in life) will always be limited to the least capable success factor. If our tires are spent, we are limited to the tire’s capability, no matter how good the car or driver is. Thus, peak performance can only be achieved by having every critical success factor developed to its fullest. Only then can the “package” achieve full potential to get to the checkered flag. The origin of the checkered flag is a mystery shrouded in racing history’s stories. The symbol, black and white checkers on a flag, is infused with rich tradition established by names well known to those with whom they compete, and many times over by drivers who fill the pages of racing history’s Who’s Who.